A jagged little protein appears to be key to how cancer stem cells differentiate and enable metastasis, according to researchers at Rice University and the Duke University School of Medicine. Researchers at Sahlgrenska Academy at the University of Gothenburg, Sweden, in collaboration with research groups in Finland, Canada, and Slovenia, have discovered a novel and unexpected function of nestin, the best known marker of neural stem cells. 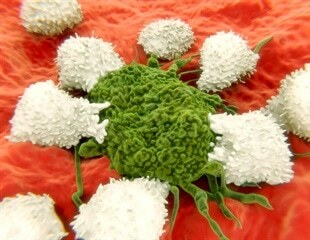 NK cells, or natural killer cells, play an important role in the body's defences against cancer and various infections. Lan Zhou, MD, PhD, associate professor of pathology at Case Western Reserve University School of Medicine, has received a five-year, $2 million grant from the National Cancer Institute of the National Institutes of Health to study human colorectal cancer. Researchers have discovered how a molecule can help prevent certain types of brain tumors by recognizing and 'disarming' harmful proteins that cause them. For the first time, Mount Sinai researchers have identified a way to make large numbers of immune cells that can help prevent cancer reoccurrence, according to a study published in August in Cell Reports. Three genes involved in nerve cell generation in the brain emerged roughly 3.5 million years ago and may have contributed to the rapid evolution of the large human brain, Howard Hughes Medical Institute (HHMI) Investigator David Haussler and colleagues report on May 31, 2018, in the journal Cell. The human body develops most tissue types during fetal development, in a mother's uterus. Yet one only tissue develops after birth: the mammary gland. Researchers in Germany have discovered that colon cancers are often resistant to existing drug treatments because they are composed of two different cell types that can replace each other when one cell type is killed. A unique cell surface protein found on triple-negative type breast cancer cells called JAG1 is a promising new therapeutic target for this hard-to-treat and highly metastatic type of breast cancer, according to researchers at the University of Illinois at Chicago. Researchers from Michigan Medicine have developed a novel method to aid the repair of difficult-to-heal fractures. When a patient breaks a bone, there's a possibility the fracture won't heal properly or quickly -- even with the aid of pins, plates or a cast. Researchers at the Institute of Industrial Science, the University of Tokyo, CNRS and INSERM, report a new organ-on-a-chip technology for the study of blood vessel formation and drugs targeting this event. The heart derives its energy primarily from fatty acids. However, if a metabolic shift to other energy sources takes place, this can result in congestive heart failure, scientists from the German Cancer Research Center and Heidelberg University Hospital have now discovered. There's a continued drive towards making in vitro assays ever more translational towards in vivo models and ultimately the clinic. This ties in with the resurgence of phenotypic screening and is a response to the perceived poor translation of the traditional simple cell-based assays, often developed to study just single protein targets. Serious liver and heart problems can affect children with Alagille Syndrome early in life. While there is as yet no cure, researchers at Karolinska Institutet in Sweden have discovered that the liver disease part of the syndrome is caused by specific malformations of the bile ducts. A newly discovered cellular messaging mechanism could lead to a new way to deliver therapeutics to tissues affected by disease, according to a new study from Harvard T.H. Chan School of Public Health. Blood vessels play a critical role in the growth and spread of cancer. The cells lining the inner wall of blood vessels (endothelial cells) and cancer cells are in close contact to each other and mutually influence each other. People with Icelandic heritage are more likely to carry a novel rare mutation in the TM2D3 gene, which leads to greater risk for Alzheimer's disease, based on a new study published October 14th, 2016 in PLOS Genetics by Johanna Jakobsdottir of the Icelandic Heart Association, Sven van der Lee of Erasmus University in Rotterdam, and colleagues.